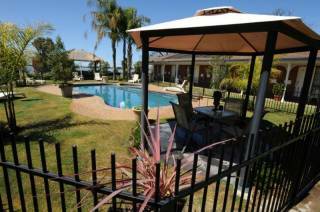 Luxury waterfront double storey home situated on the "golden mile" in Mulwala. 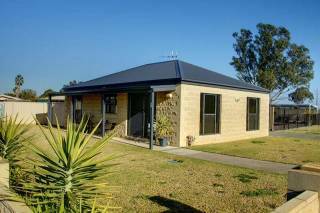 Peaceful and quiet surroundings, ideally suited to large groups. Downstairs consists of one queen bedroom, sleeping two people and one bathroom. Rumpus room has two fold out leather sofas, able to sleep four people at an additional cost. Extra large family room. Upstairs consists of four bedrooms, capable of sleeping ten. Two queen bedrooms, each with own en-suites. One bedroom with two single beds and one bedroom with four single beds sharing another bathroom with seperate toilet. Large family room. Upstairs also has two separate balconies. Home has a huge fully equipped kitchen with two fridge/freezers. Dining room consists of large table (4.8m x 1200mm) with seating for 12 people. Heating is provided by ducted gas throughout the house. Fully air-conditioned, with two large Bonaire air-conditioners. Large outside entertainment area . Full laundry facilities. Bath mats,face washers,hand towels, tea towels supplied. Undercover storage 11m x 3m x 3.5m high. Modern and quality furnished throughout. A great place to relax, fish from the jetty (rod holders provided) - play golf or enjoy water sports - ski from the jetty. Access own private boat ramp at rear of house. Courtesy buses available to and from all clubs.